The Catholic Youth Organization (CYO) of the Diocese of Brooklyn offers a wide variety of sports programs that help keep the youth of the diocese involved in their parishes. And now, add one more activity to that growing list. The CYO has begun developing a diocesan-wide cheerleading program. Several parishes have had their own cheer teams, and the focus is now to form an all-encompassing program. 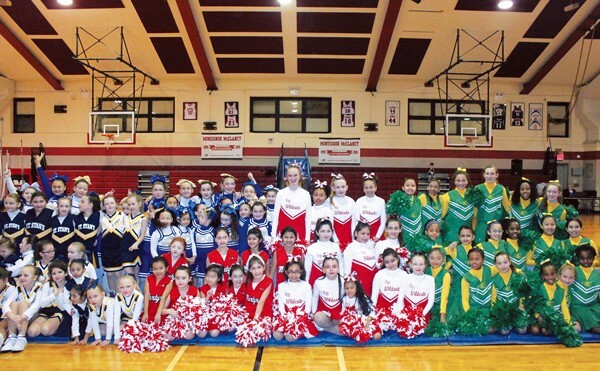 To begin that process, CYO hosted its first-ever Diocese of Brooklyn Cheerleading Showcase Feb. 27 at Msgr. McClancy H.S., East Elmhurst. Five of the diocese’s 12 cheerleading squads were on hand to showcase their talents and ramp up the energy and spirit for the budding program. The event included the Wildcats from Sacred Heart, Glendale; the Gators from St. Gregory the Great, Bellerose; the Eagles from American Martyrs, Bayside; the Blue Thunderettes from Immaculate Conception, Astoria; and the Marlins from St. Stanislaus, Maspeth. Each team performed an opening cheer, followed by a floor dance routine and concluded with a closing series of cheers. There were also routines that included all five teams and even included young girls from parishes that do not yet have a team. “We do hope this will spark the interest for other parishes to start a cheer program at their school or church,” Caldera said. Just like all the CYO sports, cheerleading teaches the lifelong values of teamwork, sportsmanship and respecting one’s opponent. Not only do the cheerleaders support their own team, but they also are sure to cheer on the other team as well. The sport has allowed these girls to stay involved in parish life and interact with other members of the diocesan youth community. Most teams meet once per week to work on their routines and learn new cheerleading skills. “It’s fun; we learn new cheers and dances,” said second-grader Isabela Forte from St. Stan’s. This is the first year of a cheerleading program from American Martyrs. It’s been a learning process, but ultimately the values of sport are surely being conveyed to the participants. At St. Gregory’s, the parish had cheerleading awhile back, and the program was revived last year. The team is a fixture at the parish’s basketball games each weekend during the winter season. As the program expands, the goal is for more parishes to become involved to make the showcase-type events even more inclusive. The long-term vision is to have diocesan cheer competitions. “This is another opportunity for the young girls who maybe don’t play softball or volleyball or basketball to be involved in CYO,” Caldera said. Teamwork makes the dream work, and the dream of these CYO teams to showcase their talents has come to fruition.